The inexperienced Greek government lost its nerve. The brink was less than a week away, and it blinked. It changed tactics at the last possible minute. It took a reckless political gamble. 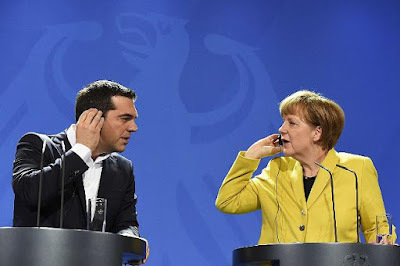 The was still no agreement of course, but Prime Minister Tsipras was standing his ground. The differences between what Greece had offered and what the official creditors demanded was about two bln euros a year. The last debate was turning on how much savings should be achieved by tax increases and how much by spending cuts. There could be no agreement without debt relief. European officials used their taxpayers money to lend to Greece so that Greece could repay the private sector creditors at the time, find it difficult to grant relief, even though they have promised it before. The overbearing power that was brought to bear on Greece from the Troika and European governments had the potential to produce a backlash. The discretionary use of authority, the lack of compassion, and the hypocrisy cast the Greece as David vs. Goliath. Tsipras's move far from a bold political move was a blunder that blunts the criticism of the European elite. After all, who can deal with such behavior? The Syriza's government claims that while it would like to reject the creditors "last best offer", it does not think it has a sufficient mandate. After all Syriza itself only won about 36% of the popular vote, and the right-nationalist party won about 4%, allowing the coalition to achieve a parliamentary majority. In some important ways, it is not clear what the issue is in the referendum. The conditions that the official creditors demanded were under the rubric of the second assistance program, which expires on June 30. A "yes" vote to accept the conditions on July 5 is for an offer that no longer exists. A "no" vote confirms that the Greek government had popular support for its refusal of the creditors' demands. It is not clear that a "no" vote means that Greece will leave EMU. Many argued that when Cyprus instituted capital controls that are was leaving EMU, which was not the case. Back in 2011, Prime Minister Papandreou called a for a referendum over the Troika's first aid package. The Greek political elite, include Tsipras, was critical and opposed to the referendum. Papandreou ended up canceling the referendum. The Vice President of the ECB Papademos became the interim prime minister. Now former Prime Minister Samaras has submitted a vote of no-confidence in Tsipras. Such a vote could be held prior to the referendum. Should the motion pass, the referendum would likely be canceled (though is has won the support of a parliamentary majority). Either a coalition government would be cobbled together or new elections would be held. In light of these circumstances, the ECB decided to maintain the current level of Emergency Liquidity Assistance (just below 89 bln euros) but not to increase it, despite the deposit flight. Reports indicate many ATMs run out of cash and banks put into place limits on cash withdrawal. Some estimate that as much as one bln euros were withdrawn over the weekend. The ECB has requested that Greece impose capital controls, and it is likely that it will. This may be complimented by a bank holiday, which would also shutter the stock market. It is possible that the disruption lasts until the referendum on July 5. Some observers argued that the resilience of the euro in the face of the deterioration of the Greek negotiations means that "bad news is good news" for the single currency. We are not convinced. We expect the euro, which closed near the week's low before the weekend gaps lower in early Asia. We expect equity markets to suffer broad declines. The yen and Swiss franc perform relatively well, as is often the case in financial turmoil. Between now and the September FOMC meeting, there will be three employment reports. June's will be released a day early, on Thursday, July 2, due to the Independence Day holiday being celebrated the following day. The US monthly employment data takes on greater significance than usual as the Fed seeks an opportunity to raise rates. To keep on track for a September lift-off, it is important that the slack in the labor market continue to be absorbed. Of the various economic relationships, at the moment the Fed seems to be putting the most confidence in the idea that as the labor market tightens, wages will rise, and this will push up core inflation. The ADP report steals some of the thunder of the employment report, but it has undershot for five of the past seven months. The consensus calls for a 230k increase in non-farm payrolls. The unemployment rate is expected to slip to 5.3% from 5.4%. The participation rate has rose by 0.1% in both April and May to stand at 62.9%. A decline in the unemployment rate while the participation rate increases is a favorable development. Average hourly earnings are expected to rise by 0.2%. This would keep the year-over-year rate unchanged at 2.3%, which matches the highest since September 2009. May wages and salaries, as measured by the personal income report, were up 5% year-over-year compared with 4.8% in Q1. There is a slew of other US economic data that will be released over the course of the week. If the jobs data is the most important, the auto sales figures are the second most important though the markets typically do not respond to it. Auto sales are likely to cool from the multi-year high recorded in May of 17.7 mln unit annual pace. However, industry indications suggest another robust month with an excess of 17 mln vehicles. Strong auto sales have implications for production, inventories, and consumption. Short-term traders give greater priority to the purchasing managers surveys. The Chicago PMI is expected to bounce back above the 50 boom/bust level. It has been below there in three of the past four months. The manufacturing ISM is expected to rise to 53.1, which would be the strongest since January, from 52.8 in May. Note that the Markit PMI unexpectedly slipped to 53.4 from 54.0. On June 27, the PBOC announced a rate cut and a targeted cut of as much as 50 bp in required reserves. The deposit and lending rates were cut by 25 bp to 2% and 4.85% respectively. It is the fourth cut since last November. The 50 bp cut in reserve requirements applies to commercial and rural banks. The reserve requirement cut of this magnitude would free up around CNY650 bln if it were universally applied. Given the decline in price pressures, real rates are still high, leaving scope for additional monetary easing. Many investors will suspect that the PBOC was responding to the biggest plunge in the equity markets since the end of 1996. The last rate cut was in May and followed a sharp decline in the equity market. Perhaps there is a "Zhou put". At the same time, the PBOC just removed the cap on lending (at 75% of deposits), and the rate and RRR cut makes this more effective. Monetary conditions have also tightened. Money market rates have risen for four weeks. A bond auction last week, failed to draw the raise the money that officials expected for the first time since last July, and this too lifted concerns. As part of the Strategic Economic Dialogue that concluded last week, Chinese officials reportedly promised to intervene in the foreign exchange market only in the case of "disorderly market conditions." As is widely acknowledged, over the past year, the PBOC's intervention in the foreign exchange market has been greatly reduced. Some may be tempted to dismiss this as rhetoric until China opens its capital account and allows the dollar-yuan to move in the same 5% range that the PBOC allows the yuan to trade against other major currencies. It is still noteworthy for a number of reasons. It appears to be the first time China has made such a concession. It suggests official confidence that sufficient monetary tools have been created to replace the influence of intervention on the exchange rate. It further signals China's commitment to re-orient its economy away from exports. In four of the past five months, China's exports have fallen on a year-over-year basis. It suggests China is willing to accept additional appreciation on a trade-weighted basis, even though by the IMF's reckoning it is as fair value. Over the last five years, the renminbi has appreciated by almost a third on a real broad trade-weighted basis. Why would China do this? Domestically, it could force an acceleration of restructuring and reforms. It may also be seen as sweetening the pot to include the renminbi in the SDR later this year.